Wave Carver sired Gem Country Derby fastest qualifier Dewey Cox. EMMETT, ID�APRIL 14, 2013�Making his first start since winning the Hawthorne Futurity last September, Dewey Cox raced to his third consecutive win and the top qualifying mark for the Gem County Derby at Emmett Racetrack on Sunday. The 10 fastest qualifiers from the three trials races will return to the Idaho raceway on Saturday, April 27th to contest the 330 yard finale. Under jockey Dallas Erickson, Dewey Cox held off Ms Eaves by a nose, despite lugging in down the stretch. Tony Hyde conditions the WAVE CARVER 3-year-old for Delray Talbot. His time of :17.137 seconds, a 91 speed index, was the fastest of the afternoon. Bred in Arizona by Jerry Windham, Dewey Cox has won three of seven career starts and earned $16,656. 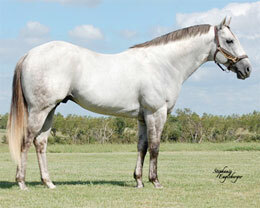 He is out of the Apollo (TB) mare Apollos Winner. The aforementioned Ms Eaves finished 1 � lengths in front of the field to post the second fastest time of :17.139 seconds. Winner of last season's John Deere Northwest Challenge, Ms Eaves races for Gerardo Prado and is trained by Rodney Hyde. The Texas-bred filly has won three of eight starts and earned $32,175. Christine Hudson bred Ms Eaves. Robert Burney had the riding assignment. Alltheshine, a filly that almost won the Dutch Masters III Triple Crown last year, returned to her winning ways with a neck victory over Zoomin For Class in the first trial. The 3-year-old filly owned by Movin On and conditioned by Guy Weeks, won six of seven starts last season and earned $20,529. She won the Gem County Futurity, Dutch Masters III Futurity and lost her triple crown bid in the Hawthorne Futurity last September. Ridden by Dallas Erickson, the sorrel miss covered the 330 yards in :17.190 seconds for the third fastest time. Grant Farms, LLC bred Alltheshine in Louisiana. For the complete list of finalists, times, sires, dams, owners, breeders, trainers and jockeys to the Gem County Derby CLICK HERE.